Will it be a marriage made in heaven? We did all this on a freezing Sunday in January and miraculously ended up with 18 players thus 6 teams. So a 3 round snake was played. It was so cold that players started behaving like penguins, huddling together for warmth. One team lost all 3, one team won a single game and the other 4 won 2 games each. Points difference came into play. Three teams were very close with differences of +1,+2 & +3 but the winners were +12 due mainly to a 13-0 thrashing of a fancied team in Round one. So the winners were Denise, Barry & Pete. Medals will be presented at a later date. 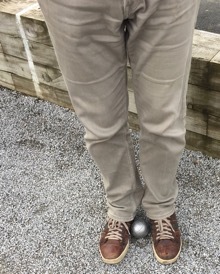 One brave player even tried to incubate a boule… without success. 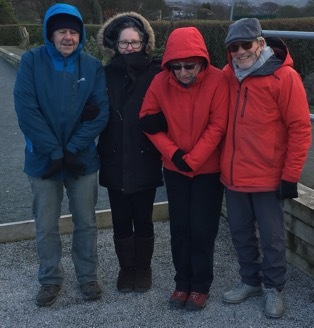 This entry was posted in Petanque on January 28, 2019 by huddersfieldpetanque.